Find a Discovery trip that explores Argentina And Brazil. There are 110 tours to choose from, that range in length from 3 days up to 88 days. The most popular month for these tours is February, which has the most tour departures. 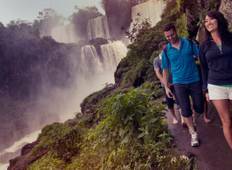 "This is a great tour that gets you to those must see place in South America . I do..."
"Thoroughly enjoyed it.The bus between santiago and mendoza was comfortable but there..."
"Joel, our tour manager was great!! I loved every part of the tour. Definitely made..."
"TBH, the tour is good generally. The accommodation is beyond my expectation and the..."
"Excellent trip. Just the right balance of structured time and free time." "The south American tour with Mendoza was a great experience overall. The hotels were..."
"I had a wonderful time on this tour. Our guide, Heidi Piche was Superb! She explained..."
"Great places, very fun group, great guide!!" "An incredibly well put together tour that highlights all of the best parts of Argentina..."
"It was punctual. But most of the tours were just half a day"